An exercise rider works out Kentucky Derby entry Justify at Churchill Downs on Wednesday. LOUISVILLE, KENTUCKY - Justify tops the list of leading contenders to win the 144th Kentucky Derby. Trainers have called this year’s 20-horse field one of the deepest in a while, though the Run For The Roses might come down to five considered to have the best prospects over 1 1/4 miles at Churchill Downs. One of two Derby charges for trainer Bob Baffert, the colt enters as the 3-1 race favorite thanks to a 3-0 record and an impressive win in the Santa Anita Derby. Justify’s challenge is putting aside 136 years of history and becoming the first Derby champion since Apollo in 1882 without racing as a 2-year-old. Hall of Fame jockey Mike Smith will try to keep him unbeaten and break the so-called “Apollo Curse.” His No. 7 post position is an encouraging omen. 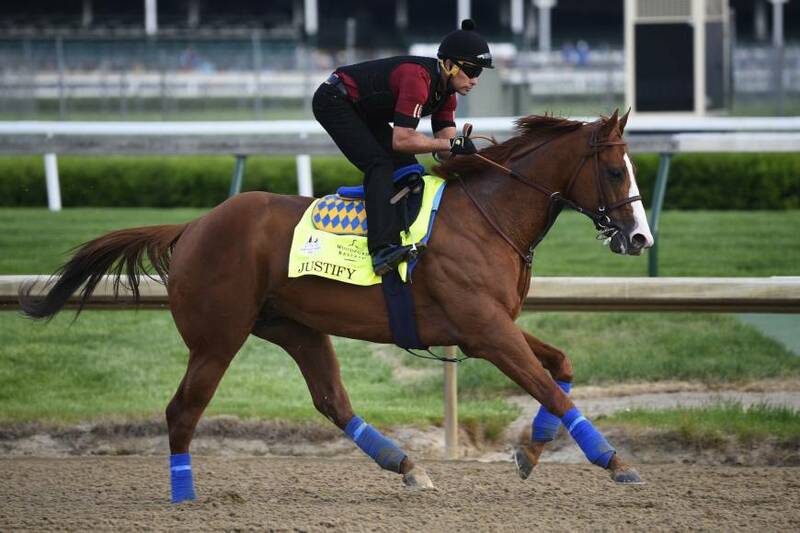 Baffert sounded a note of caution when talking to reporters about Justify’s chances of becoming the first horse since Apollo in 1882 to win the Kentucky Derby without racing as a 2-year-old. “I’ve led the best horses out here before and got beat,” Baffert said. “I’ve always had an ‘expect the worst, hope for the best’ kind of attitude. You don’t go nuts that way,” he added. 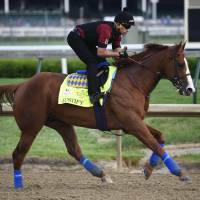 But Baffert said the so-called “Curse of Apollo” was not weighing on him. And the California-based Baffert could not mask his excitement at having landed a horse whose talent was apparent from the outset. “The first time I worked him at Santa Anita, he was pretty impressive, doing it really easy,” Baffert said. “We knew he would win his first out. “He’s always been a superior animal. When they’re that big and beautiful, and then they can run, the way he’s bred, all the ingredients are there. Now he just needs some racing luck. The 5-1 second choice has won his last three outings and four overall with a second in seven starts in Dubai, Great Britain and Ireland, where he’s been based. He might need more than international experience to become the first European horse to win the Derby. Strong, outgoing and trained by Aiden O’Brien, Mendelssohn must quickly learn Churchill Downs after hitting the track for the first time Thursday following quarantine since his arrival. He’ll start from the No. 14 post. Trainer Todd Pletcher’s hopes of winning consecutive Derbys look good with this unbeaten colt, who has won all four starts beneath Luis Saez by a combined 14 lengths. His most recent outing was a four-length triumph in the Grade 1 Arkansas Derby on April 14, which was impressive but also narrowed the turnaround window. One of four members of Pletcher’s so-called Derby “Todd Squad,” he has career earnings of $1,177,800. He’ll start from the No. 16 post. The jockey combination of Javier Castellano and John Velazquez has made another Pletcher pupil one of the horses to watch and a tempting betting choice at 8-1. The riders have two wins each over Audible’s last four starts, though Castellano will ride him in the Derby while Velazquez guides Vino Rosso for Pletcher. Audible’s No. 5 post position gives him a good spot to make noise. Initially second to McKinzie in the Grade 2 San Felipe Stakes, the Kentucky bred was awarded the victory in his 3-year-old debut after a postrace disqualification. He’s 4-1-1 in six starts, with Corey Nakatani earning three of those wins during his juvenile season. Jockey Victor Espinoza, who rode American Pharoah to the 2015 Triple Crown, will make his first start atop Bolt d’Oro after two outings beneath Javier Castellano. He’ll have to work from the outside in with the No. 11 post.